Matthew Newland, 2006, who repeatedly stabbed a stranger. 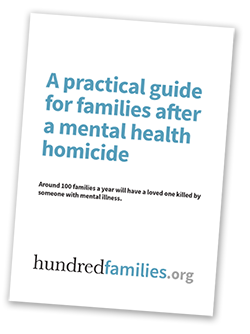 Each of these reports made a number of common recommendations for improvements – record keeping, care planning, treating drug abuse, risk assessments, and listening to the families amongst others. And each time a report was published, a representative from the health authority would appear in the media saying how the recommendations had been fully acted upon, how they were doing all they could, that it all happened a long time ago and things were much better now. But then another incident would happen and two years later another report would appear, with very similar recommendations and another spokesman would again trot out the same old phrases and hope people would believe them. The last Bristol homicide Inquiry, into the care of Matthew Newland, was one of the better ones. It was an incisive and fair report which made a whole series of local and national recommendations for improvements. The panel tried exceptionally hard to ensure their recommendations were fully implemented in practice by the Mental Health Trust. They organised review meetings for months afterwards to check on progress, national conferences were held to try and make sure lessons were learned across the country. They were even debates in the House of Lords. Yet eighteen months later the Newland Inquiry recommendations had still not been fully implemented by the local mental health trust. And in the meantime my father was killed by one of their patients. And the same old problems all appeared again in the care of my Dad’s killer – poor record keeping, care planning, risk assessments, treating drug abuse, listening to the families. Mental Health authorities in Avon & Wiltshire had been warned five times before about consistently poor and dangerous practice – yet they did nothing effective about it. In Sunderland in January 2004 Colin Johnson was brutally murdered by an old school mate, Garry Taylor. Taylor was paranoid schizophrenic with a history of drug abuse who was well known to the authorities for his long history of serious violence with knives. He’d previously stabbed his girlfriend many times and had been sent to a secure psychiatric hospital as a result. When he was released back into the community, some mental health staff were so frightened of him they kept their doors double barred at night. On several occasions he was given a risk assessment – completed by scoring and adding up points for risky aspects of his behaviour. The more points he scored, the greater risk he presented. Maybe it was because of their nervousness around him, but on three separate occasions the staff kept adding up his scores wrongly (giving him a score of 33 instead of 62). This scored him as only a moderate risk to others. If they had added the points up correctly, he would be ranked as a severe risk – which was in fact what he turned out to be. Although he was violent and psychotic, he didn’t take his medication because he didn’t believe he was ill. His family made repeated calls to mental health services trying to get him treatment but were unsuccessful. On the evening of January 17, Taylor attacked Colin Johnson with an axe, almost decapitating him. He suffered severe and repeated injuries. It was a completely unprovoked attack on an innocent man. At his trial, a psychiatrist from Rampton high security hospital, (a man who routinely dealt with particularly severe cases), said Taylor was one of the most psychotically disturbed people he had ever met. The Independent Inquiry The independent inquiry into the case was a model of good practice. It was truly independent, it was rigorous, it was thorough and it was based on solid evidence. It identified many of the same failings that feature in other investigations – record keeping, care planning, risk assessment, listening to the family, and team working, among others. And the inquiry team didn’t shy away from the proper conclusion of all the failings they discovered. They found that in all probability, had the failings in mental health services not occurred, Colin Johnson would still be alive today. And instead of making a whole series of recommendations they made just one – for an external service improvement team to come in and give the whole system a clean sweep. This was a radical idea which promised much change at a fundamental level. The outcome Two years later, the external improvement team published their report. A great deal had been achieved it claimed, but risk assessments, care planning, listening to the families, keeping good records, and treating drug problems – some of the core problems identified by the inquiry – still remained to be dealt with more than five years after the original murder. Five years later the health trust still hadn’t made the necessary changes. Which was disappointing because one of the senior members of the external improvement team, Dr Christine Vize appeared to be just the sort of external expert that could help implement change as she was responsible for improvements and ‘new ways of working’ in her own local Mental Health Trust. Unfortunately that trust was the Avon & Wiltshire Partnership Trust, which operates in Bristol, and Dr Vize is a fierce critic of independent homicide inquiries, so perhaps it was not so surprising that efforts to create change in Sunderland were not so successful. Avon & Wiltshire Inquiries Avon Health Authority. Philip Milner, a director of the SHA said “There have been dramatic changes and improvements in services in the last four years and we are now well on track to minimise the risk of this ever happening again.” Interviewed for BBC Points West – 3 July2003 June 2006. Similar Problems in the care of Stephen Newton (who killed my father) from Avon and Wiltshire Mental Health Partnership NHS Trust. Christine Vize: ‘Mental health: no-one wins in homicide blame game’ Health Service Journal 29 November, 2007.